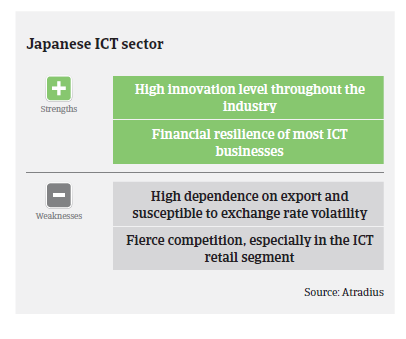 The Japanese ICT industry is well established and holds a global reputation for excellence and innovation. 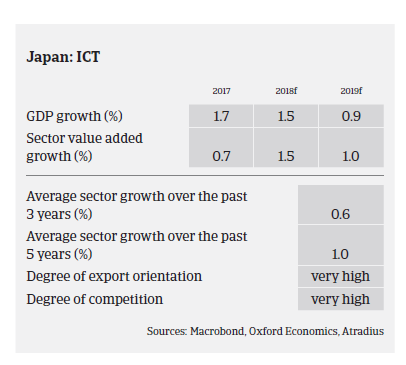 Japan is the third largest ICT market in the world after China and the USA, with well-known companies such as Hitachi, Sony, Panasonic, Fujitsu and NEC having a large market share. The market will continue to be robust, reflecting the affluence of local customers and sophistication of the enterprise base. There should be a boost in 2019 and 2020 as the country prepares to host the 2020 summer Olympics in Tokyo. Computer hardware sales are expected to amount to JPY 2.45 trillion (EUR 18.6 billion) in 2018 and to increase modestly to JPY 2.54 trillion (EUR 19.3 billion) in 2021, resulting in a compound annual growth rate (CAGR) of 1.2%. This is primarily due to a strained PC market with longer replacement cycles and a squeeze on tablet and low-end notebook purchases due to smartphone use. Software sales are expected to amount to JPY 3.83 trillion (EUR 29.1 billion) in 2018 and to increase to JPY 4.31 trillion (EUR 32.8 billion) in 2021, a CAGR of 4%. Investment in data analytics, cyber security and cloud solutions offers a growth opportunity for software vendors. IT services sales are expected to amount to JPY 18.28 trillion (EUR 139.2 billion) in 2018 and to increase to JPY 20.64 trillion (EUR 157.2 billion) in 2021, a CAGR of 4.1%, fuelled by higher spending in 2019 and 2020 ahead of the Olympic Games in Tokyo and increased ICT investment by Japanese businesses. On average, payments in the ICT industry take between 90 and 120 days. The business culture in Japan promotes prompt payment, and therefore the number of protracted payments is low. The insolvency level in the ICT sector is low and is expected to remain stable in 2018. 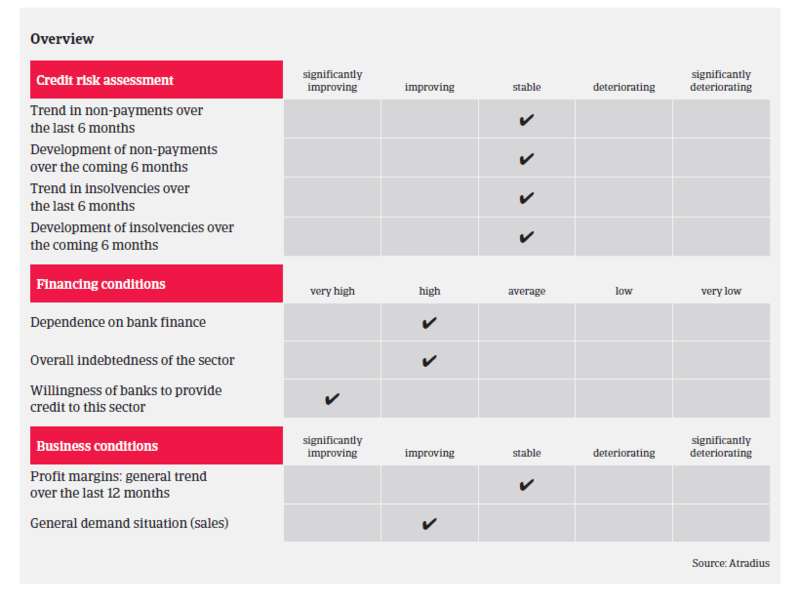 Our underwriting stance for this industry is open due to stable growth and positive outlook, the low insolvency level, good payment experience and the fact that the market is dominated by large corporates and well-established domestic businesses. 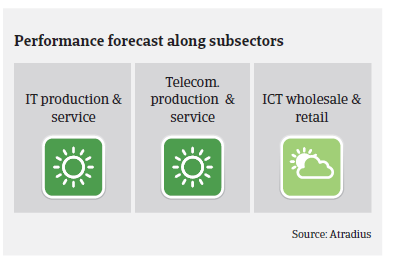 The financial profile of ICT producers and service providers is generally good, with the majority of companies generating high revenues and profits along with strong balance sheets. While the ICT wholesalers and retailers segment is highly competitive with generally low profit margins, credit insurance claims have remained low so far.